Back row l to rt Charlie (Peanuts) Didzun, outfield; Ollie Worthington, outfield; Wm (Buck) Austen 1B; Front row Jack Conway SS; Hepple (Hep) Shipley 2B; Alfred (Happy) Johnson pitcher; Arthur (Sharkey) Anderson C; Herman Blanken 3B; Lou White outfield;  Mascot is Retha Kizer. Property of Lake Oswego Friends of Library. Truchot...enlarged framed [illegible] Sticker: 94330. Description Scratch marks on front. Appears to be the same as photos 22b & c. Grandson of Clifford (Happy) Johnson says pitcher is Clifford, not Alfred. 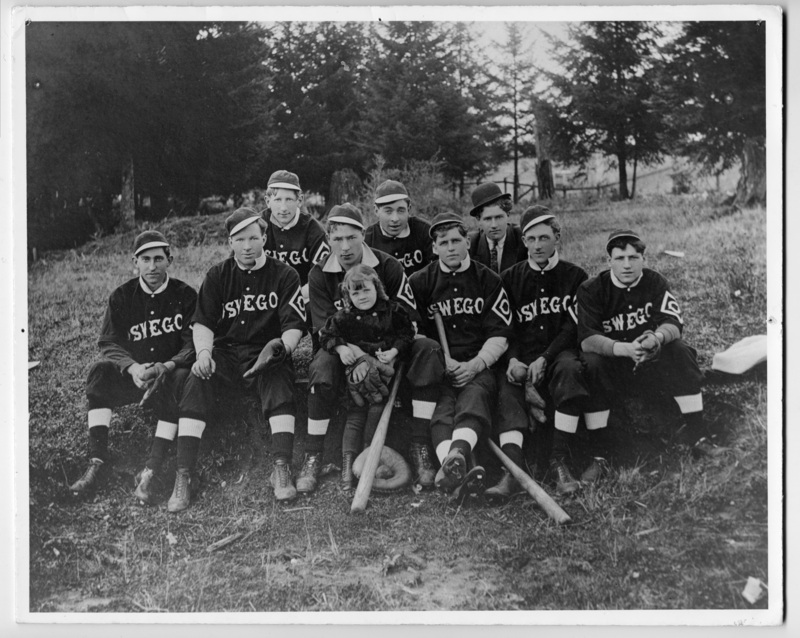 Transcription Back row l to rt Charlie (Peanuts) Didzun, outfield; Ollie Worthington, outfield; Wm (Buck) Austen 1B; Front row Jack Conway SS; Hepple (Hep) Shipley 2B; Alfred (Happy) Johnson pitcher; Arthur (Sharkey) Anderson C; Herman Blanken 3B; Lou White outfield; Mascot is Retha Kizer. Property of Lake Oswego Friends of Library. Truchot...enlarged framed [illegible] Sticker: 94330.